The PKU Sketch Re-ID dataset is constructed by National Engineering Laboratory for Video Technology (NELVT), Peking University. 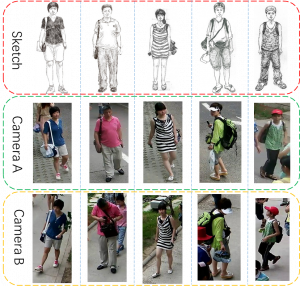 The dataset contains 200 persons, each of which has one sketch and two photos. Photos of each person were captured during daytime by two cross-view cameras. We cropped the raw images (or video frames) manually to make sure that every photo contains the one specific person. We have a total of 5 artists to draw all persons’ sketches and every artist has his own painting style. The images and the corresponding annotation results can only be used for ACADEMIC PURPOSES. NO COMERCIAL USE is allowed. You can download the agreement (pdf) from here. After filling it, please send the electrical version to our Email: [email protected] (Subject: PKU-SketchReID-Agreement) and mail/fax the paper version to our lab: Room 2604, Science Building No. 2, Peking University, No.5 Yiheyuan Road, Haidian District, Beijing, P.R.China (fax: +86-10-62755965). ©2013-2019 Institute of Digital Media, Peking University, China | Maintenance | Powered by WordPress | 54 queries in 0.076 seconds.